Works of Ahhh Wood Solar System Mobile from MasterPieces is an out of this world learning experience. This easy-to-use kit is for the whole family and can be used in the classroom, too. 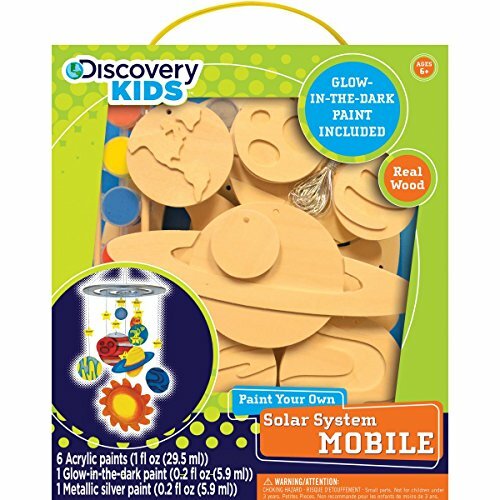 The solar system kit comes with 10 pieces of real wood, labels for your planets, metallic silver and glow-in-the-dark paints for fun learning day or night. Instructions include fun facts about each planet. We’ve included plenty of inspirational images and drawings to show any painter how to achieve beautiful results. Turn off the TV and make something fun together. Founded in 1995, MasterPieces is well-known for producing high quality puzzles and wood paint kits that are fun for the whole family. Our puzzles are manufactured with board that contains 100% recycled post-consumer content. All puzzle sheets and packaging wraps are printed with earth-friendly soy based inks. 100% water based coating protects our packaging while also protecting the environment. At MasterPieces, we are committed to product safety and environmental responsibility. Our products meet or exceed all current testing regulations and safety standards in force for our industry.